I’m not going to lie, I was nervous about this race. I’ve never done a trail run before and I normally run on pretty flat paths. The last hilly race I ran took me 50 minutes to complete. 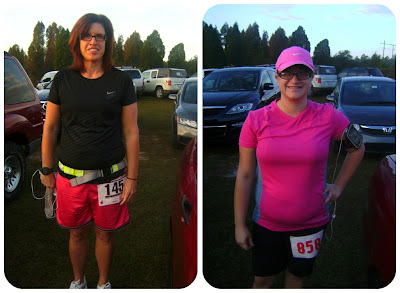 I was hoping to do good, push through the pain, even though I had a few bad runs leading up to this day. My mom was running the half-marathon, which started a half-hour before mine, so I had to say good-bye to her and wait in anxious anticipation for my race to start. I was incredibly nervous about disappointing myself. I’m sad to report, I made none of these goals. I didn’t have a good race and didn’t enjoy myself in the least. I hated the trail. I had to dodge roots, uneven terrain, and horse poop. For a good mile, I was shuffling hay under my feet. 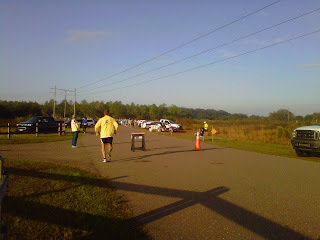 And due to the fact the race didn’t start until 8:30am and I had no food in my body, I became weak almost instantly. I really need to work on fueling and hydrating better for my runs, especially on race day. I was also still dealing with some chest congestion, which meant a lot of yucky coughing and clearing my throat. The first mile of the race was relatively easy. It was on flat road and while most of the runners were ahead of me, I felt like I had a good pace. As much as I wanted to catch up to the other runners, I know I had to keep my own pace. I have this competitive nature that doesn’t really match up to my running ability. It’s a problem. I took a break once I got past the first mile, but then we started running on the trail and it was tough. My ankles began hurting immediately, due to the uneven terrain and having to watch my step for overgrown roots and horse poop. I never feel like I got my groove back after that. It was a tough race and I’m trying to find solace in the fact that it was my first trail run and there were a lot of serious runners. I’m talking zero body fat, running 6-minute-mile-marathon serious runners. It was the first time I had ever felt intimidated at a race. I’m used to fun races like the Turkey Trot with more first-time runners and lots of walkers. I was out of my league at this race, shown with the fact I was quickly at the back of the pack within the first 15 seconds. I’m probably never going to do a trail run again. I didn’t enjoy the trail at all, and couldn’t even take in the scenery because I was so annoyed with all the mess. I know it was partly because I had never even walked on a trail like this and partly because I hadn’t fueled correctly. Trail running is hard. And it’s not for everyone. My next race is on Thanksgiving, which will by my fifth Turkey Trot. Originally, we weren’t going to do it but we have a sentimental value tied to this race. It’s a nice way to get some activity in before a day of gorging. And I know the course by heart. I know that it’s well-organized, with each mile marked, and plenty of spectator support (they even have bands playing through the course!). I never realized how much I love spectator support until the past few races I’ve run which has had barely any. And since I managed to PR on my first trail run, I’m pretty determined to hit below the 40-minute mark on this next one. Have you ever run a trail run? If you have, did you like it? If not, would you ever (after my scary recap!)? I prefer trail running for daily runs, but i am not sure how I would feel about a race. It seems that the trail could easily get congested. Good luck with the Turkey Trot! Hello?! Nice job on the PR!! I don't think I'll ever do a trail run. I'd probably break and ankle. Or my neck. I'm still proud of ya!! I'm doing a Turkey run too. I'm excited to see how it goes. P.S. I am intimidated at each and every race I go to. I keep thinking I'm a fool for even being there. I don't know if this will ever pass. I've never ran a trail race, but I've hiked plenty of trails on the mountains around here, and it can be rough. I'm actually hoping to run some of the trails because Husband prefers to run on trails … but we'll see! Before my 5k, I made sure to drink PLENTY of water the night before. The morning of, I drank a glass of water (didn't want to have to use the bathroom while I was running!) and I just ate some toast with almond butter. Throughout the race, I felt like I had fueled properly, and then I was so hungry after the race, so we went to Dunkin Donuts for coffee and a breakfast sandwich. SO GOOD. I've heard trail runs are very tough. I never want to drink anything before a race because I don't want to pee. I typically have a half PB sandwich though and I'm good…that's all I had for my half and full marathon then I had GU along the course for the full but I didn't eat anything else when I did the half. But you still TRIED and that's what counts! I don't run so you did better than I would have, hehe. Aww good job for finishing and PRing! That is very impressive. I think it's amazing you finished it!! I'm so very impressed with you – I don't know if I'd ever be able to do a trail run 🙂 Great job!! You still PR'd! And that is awesome! Trail running is HARD. I have done it a few times. I tried for the first time in college and got in WAY over my head. I have kind of gotten better. Kind of 😉 I prefer crushed limestone trails. Congrats on the PR! I've never tried running on a trail, so I'm super impressed. Enjoy the turkey trot! You did it! Thats all that matters. I have trouble walking on flat ground so a trail would be an obstacle course for me, even walking.